Velda is Associate Professor in English and Literacy Education. She completed her DPhil in the Oxford University Centre for Educational Assessment in 2011. She has been a Lecturer in English in Education at the University of York and Course Leader for the PGCE in English with Drama at the University of Warwick Institute of Education. She began her academic career as a mediaeval Celticist, but after completing a BA and MPhil in Anglo-Saxon, Norse and Celtic at Cambridge University, she trained as a secondary English teacher at Leeds Trinity. 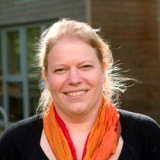 She taught for several years in North Yorkshire, with a particular interest in English Language A level, before taking up an ESRC studentship at OUDE. She is an external subject expert for Ofqual. Velda researches in the fields of English in Education and Educational Assessment. Within the field of English, her work considers both what it means to be ‘good’ at English and what English, media and drama education are ‘good for’. Some of her work considers the ways in which English education relates to political priorities and desires. She is particularly interested in the ways in which students and teachers engage with the subject of English, in its broadest sense. She also has an interest in teacher development, in terms of English teacher identity, learning to assess, subject knowledge development, and classroom interactions. She contributes regularly to professional publications such as NATE’s Teaching English magazine. In assessment Velda is particularly interested in the way in which markers, especially examiners, make decisions, and the values and identities they espouse in doing so. Her doctoral work focussed on the cognitive process of examiners of A level History and English, and was funded by an ESRC studentship. Related to this topic is an interest in e-assessment and future technologies, and their applicability to assessment. Elliott, V. (2014) ‘MARC: a thought experiment in the morality of automated marking of English’, Changing English, 21(4). Elliott, V. (2014) ‘The treasure house of a nation? Literary heritage, curriculum and devolution in Scotland and England in the 21st century’, The Curriculum Journal, 25(2), pp. 282–300. Ingram, J. and Elliott, V. (2014) ‘Turn taking and ‘wait time’ in classroom interactions’, Journal of Pragmatics, 62, pp. 1–12.